(Annapolis, Md.) – Chesapeake Conservancy today announced its latest Riverview virtual tour will allow users to explore the Patuxent River using a computer, smart phone, or tablet. The tour will show the river from the perspective of a kayaker and provides access to a number of conveniences including geographic locations, historical information, and recreational amenities. 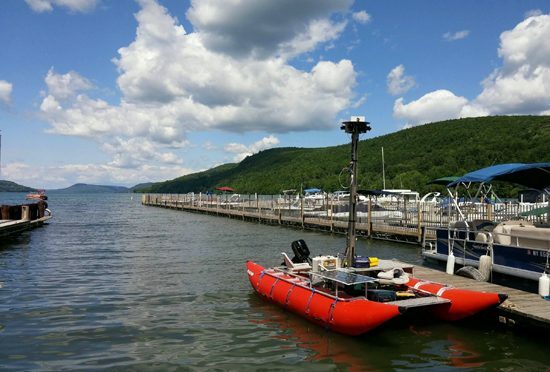 The Conservancy will once again partner with Richmond-based Terrain360 to obtain high-resolution, 360-degree images using a custom designed pontoon boat with six cameras mounted 10 feet above the water’s surface. Images will be taken every 40 feet and later stitched together to create a digital image map of each river, accessible by anyone with an Internet connection. The virtual tour will be available to the public on the Chesapeake Conservancy’s web site at http://www.chesapeakeconservancy.org/riverview. The Conservancy’s 10 Riverview virtual tours completed thus far include rivers such as the Elk, Patapsco, Northeast, Nanticoke, Potomac, Rappahannock, Sassafras, Susquehanna, York, and James (courtesy of the James River Association).